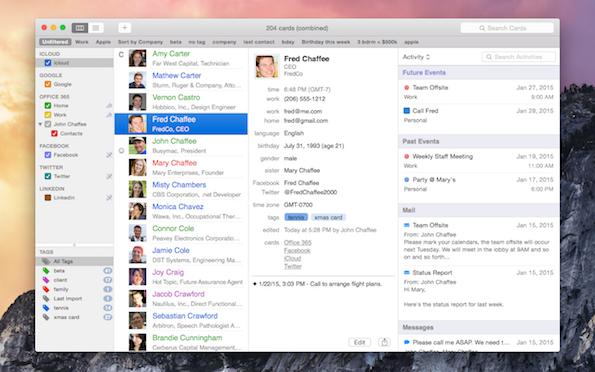 BusyContacts can display your contacts in two formats — Card View and List View. The Card View lists your contacts in a single column on the left with each card displaying a photo, name and subtitle (company, title, city or email domain). You can control how Names are displayed in the Card View (e.g., "Tim Cook" or "Cook Tim") in General Preferences. This setting also applies to the List View. You can control the sort order of the Card View (Last/First, First/Last, Address Book or Tag), in View Preferences. 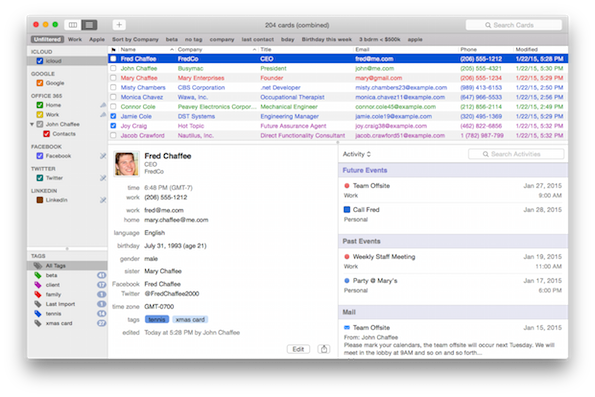 The List View displays your contacts in a table with customizable columns and sort order. Show or Hide columns by control-clicking on the column header. Sort a column by clicking the column header. Click again to reverse sort. Move a column by dragging the column header. Resize a column by dragging the right edge of the column header. You can further customize the List View in View Preferences by selecting BusyContacts > Preferences > Views. Sort Card View by — Controls how contacts are sorted in the Card View (Last First, First Last, Address Book, or Tag). Note: You can control how the names are displayed (Last First or First Last) in the General Preferences tab. List View Font — Controls the font and size of the List View columns. List View Columns — Controls which columns are displayed in List View. You can also choose which columns to display by control-clicking on the column headers in List View. 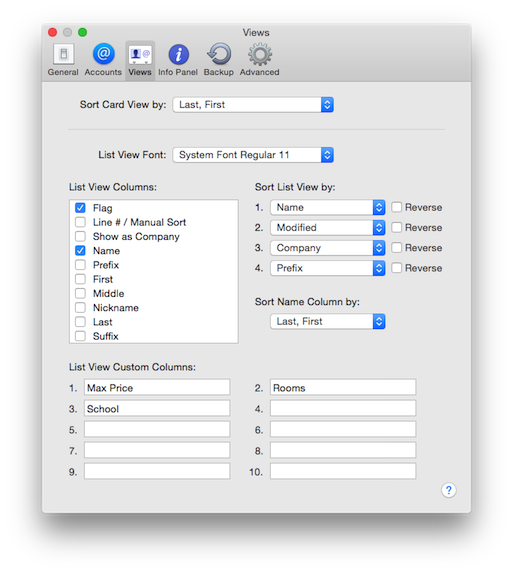 Sort List View by — Controls the sorting of the List View. You can sort up to four levels deep in ascending or descending order. You can also choose which columns to sort by by clicking on the column headers in List View. Sort Name Column by — Controls how the Name column is sorted in the List View (Last First or First Last). Note: You can control how the names are displayed (Last First or First Last) in the General Preferences tab. List View Custom Columns — You can display up to 10 Custom Fields in the List View by entering the Custom field labels and checking them.